Recently I have been developing some of my embroidery work, its the thing I love the most. 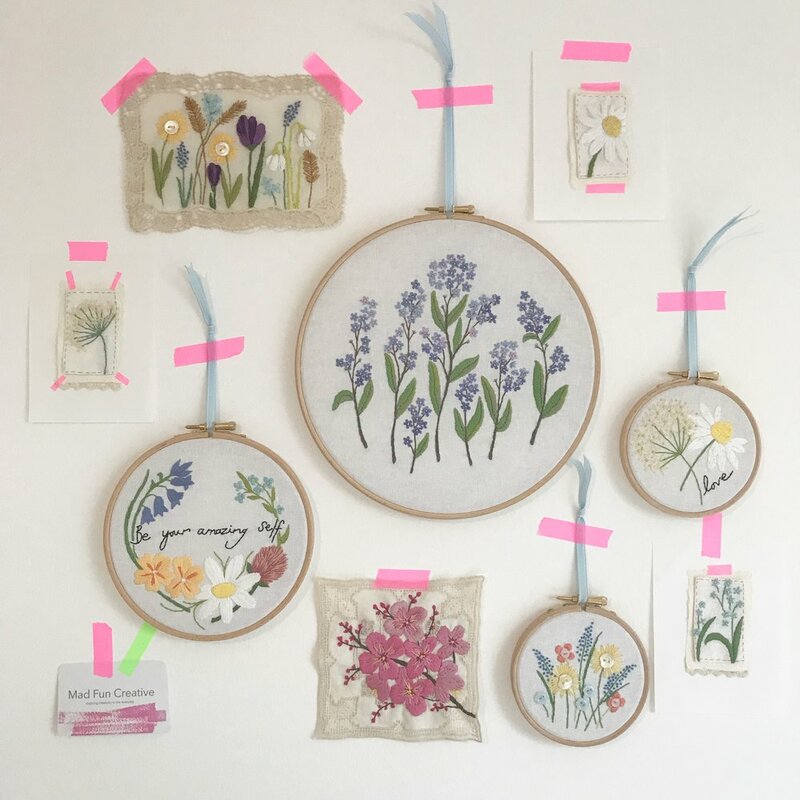 A lot of my embroidery experience was when I worked in New York working in a design studio designing prints and embroideries for Fashion and Homeware. Much of what I did I can't share on here as it was work for other clients so I don't own the rights to share in this space. So now having this time to explore my own personal work has been really great. 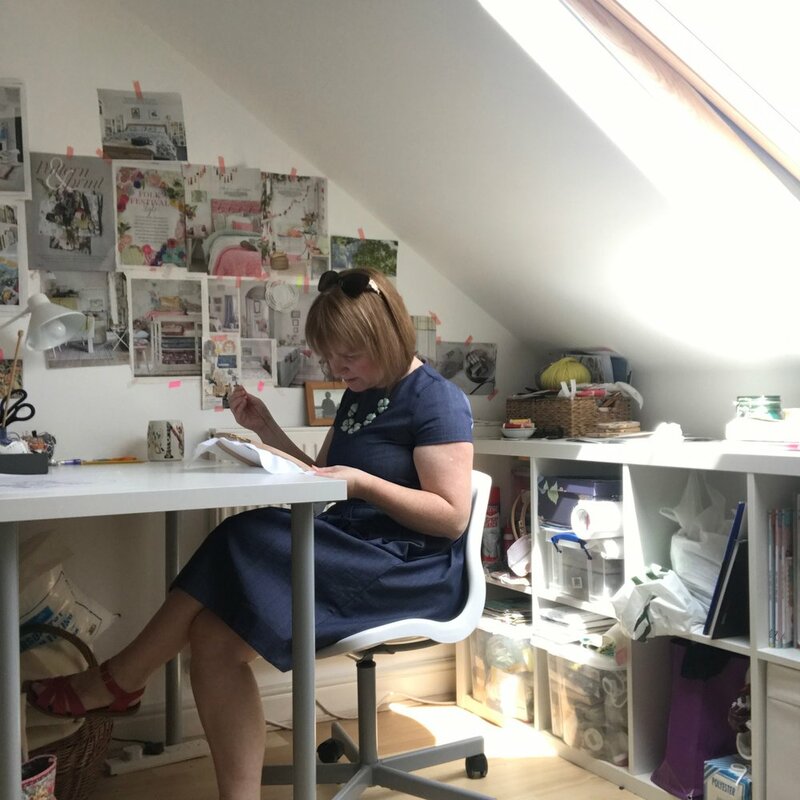 When we moved to Yorkshire we found a house that gave us the space we need for our creative work and now Davinder and I share this studio in the top of our house. Its very peaceful and since we are so close to the countryside its wonderful to hear the birds singing outside, and to just step outside our front door for inspiration. 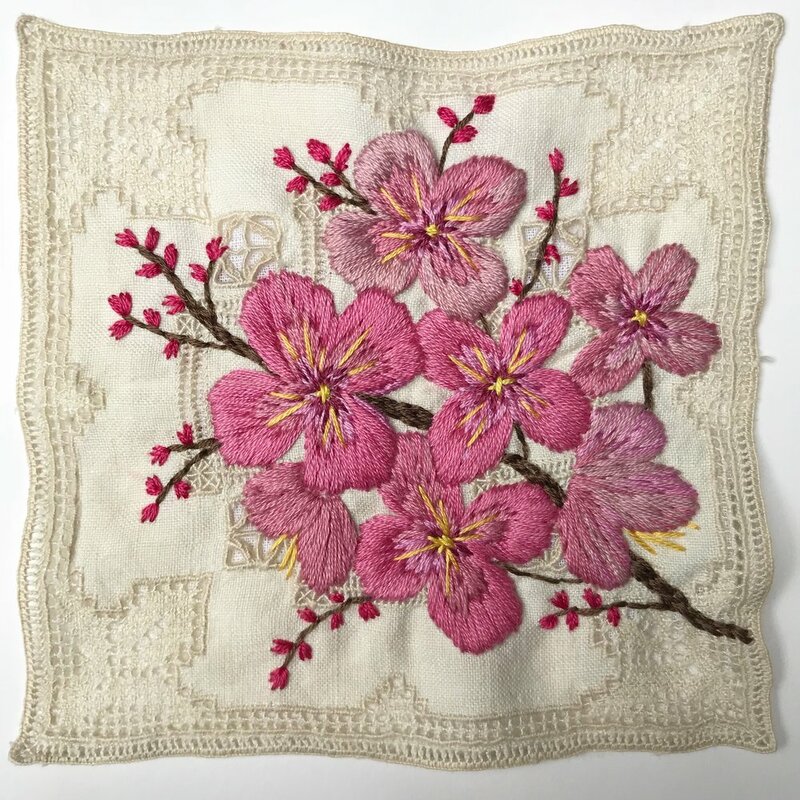 There is inspiration all around us and I have been enjoying creating my own designs some of which will eventually become kits I sell. Also some of my own stitched peices are for sale. I have many methods of transferring a design to fabric, I often use a fine line water dissolving pen, it only needs a small amount of water to disappear usually with a cotton pad. I like to stitch using good quality thread, I use DMC threads a they are superior in quality and I don't believe it pays off to use cheap quality thread, one thing you will find with cheaper threads is you'll be getting into twisted knots constantly. Its good to invest in quality materials if your going to spend that much time on a special embroidery. Most good craft shops will sell DMC but here is a link to their web site if you want more information. I love seeing all these designs displayed together they look so inviting. 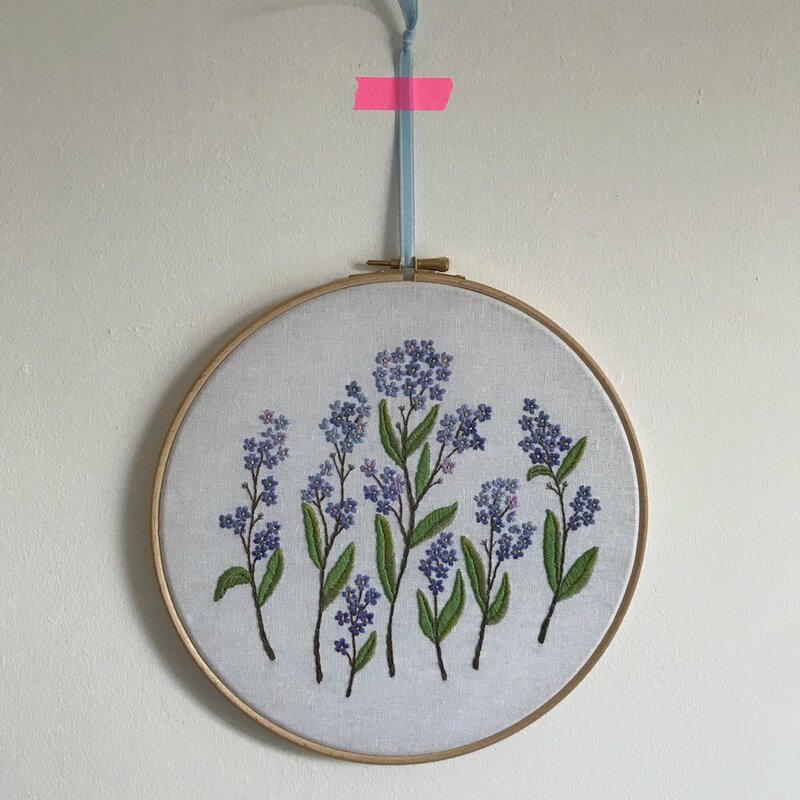 I am currently so inspired by British wild flowers, mixing my stitches with little buttons and displaying them in the hoops as a permanent feature. Adding little words of encouragement here and there. I am hoping to teach some workshops very soon creating small designs like this, so watch this space and certainly drop me a message if you are interested in joining me for a workshop. A friend recently asked me to create her a design that was just Forget me nots and the images below show how it turned out. As you can see I used the water dissolving pen to create the design in the hoop, this was then washed away. I loved building up the layers of shading in each tiny flower, it took some time to do but I consider myself to be pretty patient and don't really mind spending the time to get the details perfect. Its hard to see the scale here but the hoop was about 9 inches diameter thats about 22cm. 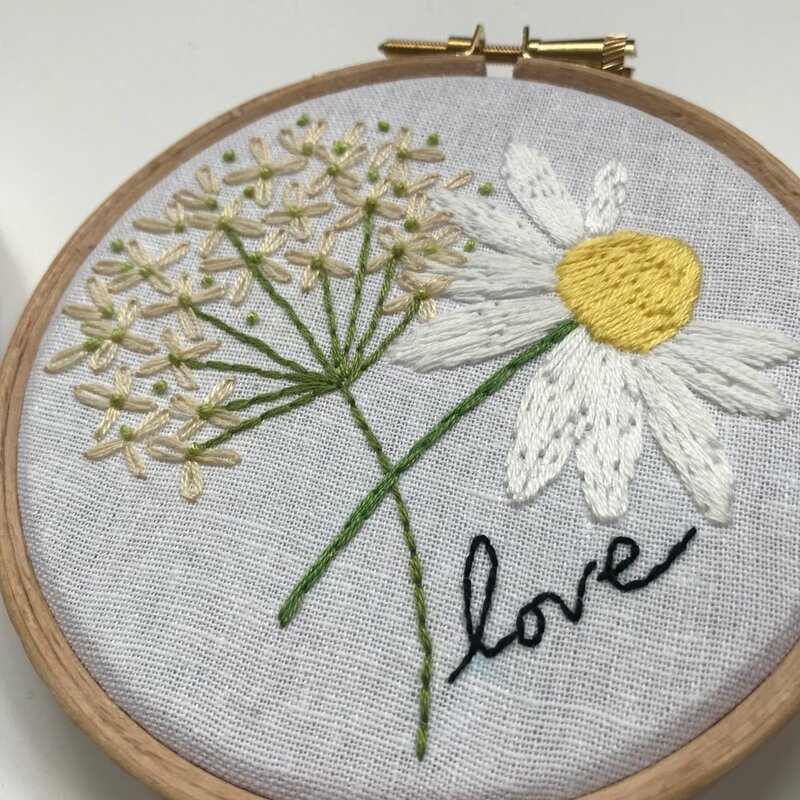 I don't have many words to share about this work other than this is me trying to put myself out there creatively, these little pieces are my labour of love and its what I want to share with others, stitching these little designs gives me so much pleasure and it can be very calming and relaxing to do. 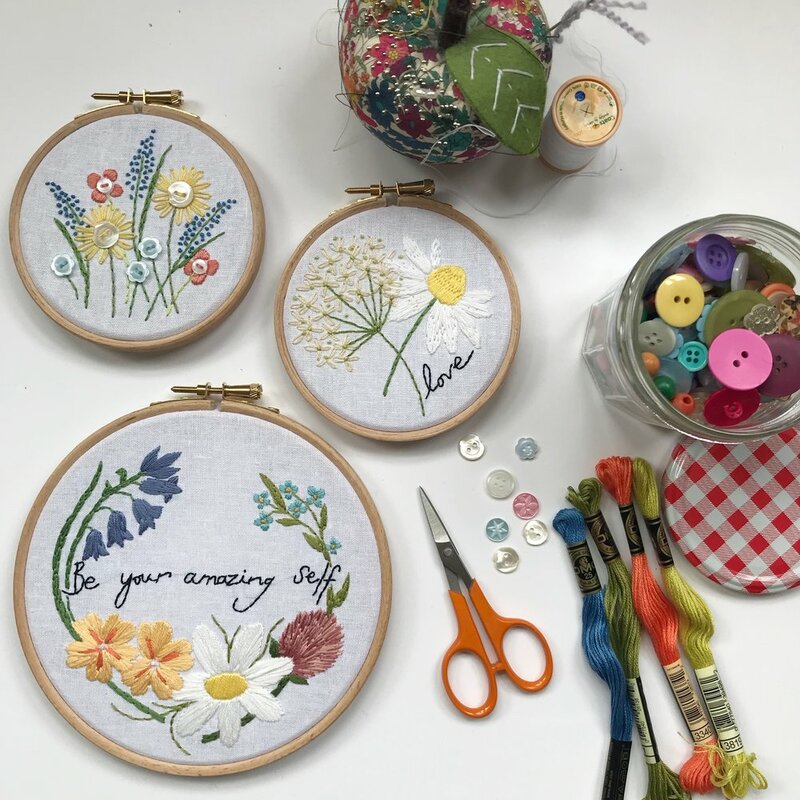 A typical day spent stitching involves lots of coffee or cups of tea and podcasts and music. I get completely submerged in my work, I love that I am able to share this work with you unlike many of the designs I have done for design studio's. I am currently in the process of working out a way to teach many of these skills to others, its an art form that has been disappearing over the past 40 years but with the upsurge of many craft TV shows and our need to escape from our hectic lives to take up relaxing hobbies embroidery has certainly gained popularity, along with dress making, quilting, knitting and crochet. I loved making these tiny miniature designs and mounting them on this hand made paper with neon washi tape adding a pop of contemporary colour. Do pop over to Etsy and have a browse, many things can be made to order or you can commission something unique to you. Your privacy is important to us we will only send you mail related to 'Mad fun Creative' We will not share your details with other organisations.